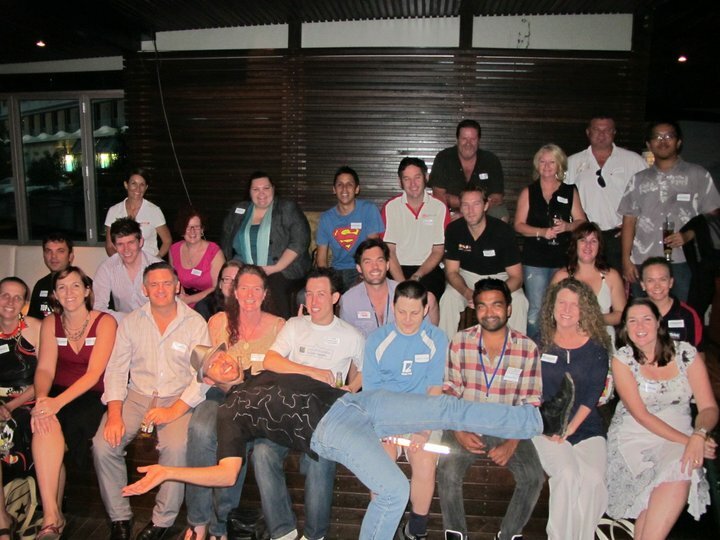 Last evening around 25 of Cairns most active Twitter tweeters turned up at the Salt House for a good ol face-to-face. Organised by outrageous Scot Simon Crerar, online editor at the Cairns Post, this was the second gathering, which has almost doubled in size. Don't know if that's a good thing. Twitter is the fastest growing social network after Facebook, and has been embraced in many local businesses and social net nerds. It was used actively during Cyclone Yasi, most famously by computer man Carl Butcher who did a live web cross with CNN. Twitter is also playing a role in the rise and fall on the Australian Labor Party, Cairns Branch. Among the mob were myself Michael Moore, Mr Savannahlander, Wendy Ackland, Jamie Evans, Fiona Henderson, Tori Sugden, Nicky Jurd, Robert Rutten, Carl Butcher, Simon Crerar, Dallas O'Brien, Richard Johnston, Philip Warring, Rashmi 'Rush' Pathak, Lisa Monks, Julie Johnston, Tammy Barker, Raden Sucalit, and eligilbe non-bachelor Kaj Haffenden. WE were going last night Mike, but the rain out here was torrential so decided that it was safer not to be driving. It's a shame as we (especially Rob) were looking forward to it. See you at the next one. I second my wife there! I hope Simon can organise another one soon!